London - Amnesty International Wednesday called on China to provide information about the more than 1,000 people detained during the protests in Tibet last March. In a statement released in London to mark the passage later this week of the Olympic torch through Lhasa, the capital of Tibet, Amnesty said the detainees continued to be held without charges or trial. 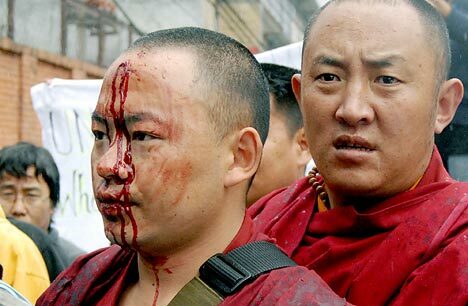 Protestors had suffered torture or ill-treatment in detention or "have been injured or died from excessive use of force by security forces," said Amnesty, quoting Tibetan organizations and media. Many detainees had been denied access to family members or lawyers. The Tibetan Centre for Human Rights and Democracy (TCHRD) estimated that close to 120 people had died from "excessive use of force" in the crackdown on protestors, while the Tibetan government in exile put the number at 200, Amnesty said. "There is very little information coming out of Tibet, but the information we have paints a dire picture of arbitrary detentions and abuse of detainees," said Sam Zarifi, Asia-Pacific Director at Amnesty International. "The complete lock-down in Tibet is allowing human rights abuses such as arbitrary detentions, ill treatment and severe censorship to go unreported and unpunished," said Zarifi. "Hundreds of people languish in Chinese prisons for peacefully expressing their opinions, in appalling conditions and without their relatives even knowing where they are.